Reconstruction Timeline Map for Readmission of Southern States into the Union. December 1863: President Abraham Lincoln announces his reconstruction plan. It offers general amnesty to all white Southerners who take an oath of future loyalty and accept wartime measures abolishing slavery. Whenever 10% of the number of 1860 voters take the loyalty oath in any state, those loyal citizens can then establish a state government. In early 1864, the governments of Louisiana, Arkansas, and Tennessee are reconstructed under Lincoln’s "Ten Percent Plan." Radical Republicans are shocked at the policy’s leniency, so Congress refuses to recognize the governments or seat their elected federal representatives. July 1864: Congress passes its own reconstruction plan, the Wade-Davis bill. It requires a majority of 1860 voters to take a loyalty oath, but only those who swear an "ironclad" oath of never having fought against the Union can participate in reconstructing their state’s government. Congress requires the state constitutions to include bans on slavery, disfranchisement of Confederate political and military leaders, and repudiation of Confederate state debts. After Congress adjourns, Lincoln refuses to sign the Wade-Davis bill, so it is "pocket-vetoed" and not implemented. March 1865: Congress creates the Bureau of Refugees, Freedmen, and Abandoned Lands, commonly known as the Freedmen’s Bureau, within the War Department. It provides temporary relief to the freedpeople in the form of basic shelter and medical care, assistance in labor-contract negotiation, the establishment of schools, and similar services. At its peak, though, the Freedmen’s Bureau only has 900 agents in the South. April 1865: The Civil War ends with Confederate General Robert E. Lee’s surrender to Union General Ulysses S. Grant at Appomattox, Virginia. President Lincoln is assassinated. Vice President Andrew Johnson, a Southern Democrat, assumes the presidency. 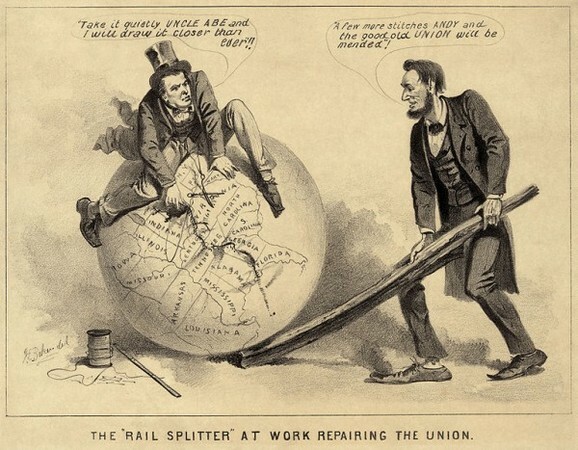 (Left) "The Rail Splitter Repairing the Union" — a political cartoon of Vice President Andrew Johnson, who was the only US senator from the South who refused to resign during the Civil War, and President Abraham Lincoln during Reconstruction in 1865. Cartoon shows Andrew Johnson, then considered a traitor by most Southerners, sitting atop a globe, dictating Reconstruction terms to Lincoln while attempting to stitch together the map of the United States with needle and thread. Lincoln responds by saying that "A few more stitches Andy and the good old Union will be mended." 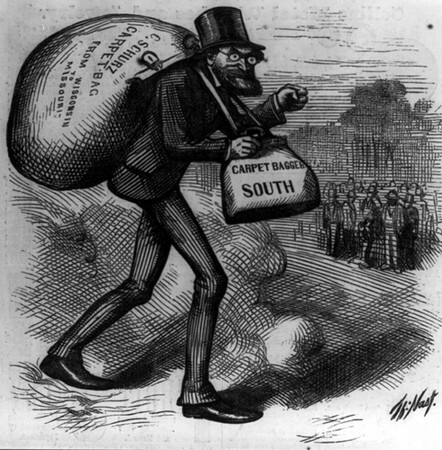 (Right) The carpetbagger was an unscrupulous opportunist from the Northern states who went to the South after the Civil War to profit from Reconstruction. Similar to the carpetbagger, the scalawag was a white Southerner -- usually a local -- who collaborated with Northern Republicans (often called Radical Republicans) during Reconstruction for personal gain. The term was also used derisively by white Southern Democrats who opposed Reconstruction legislation. Although Gen. Sherman coined the phrase that war is all hell, the carpetbagger and scalawag had to continually look over his shoulders because most Southerners were now eager with an opportunity to assist in filling the hot place. 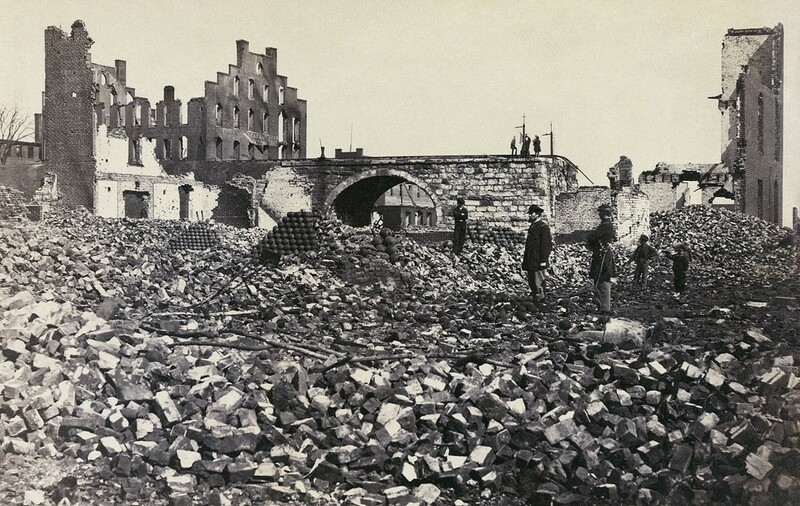 Because of Civil War, the Confederate capital of Richmond lay in ruins and rubble. April 1865.
removed the and then raked with canister from an artillery battery, it of When the war concluded, several communities had lost nearly all their men due to military service. Summer 1865: President Johnson implements his reconstruction plan. It offers general amnesty to those taking an oath of future loyalty, although high-ranking Confederate officials and wealthy Confederates have to petition the president for individual pardons. The plan also requires states to ratify the 13th Amendment which prohibits slavery and to repudiate Confederate debts. December 1865: Congress refuses to recognize the state governments reconstructed under Johnson’s plan. Republicans are disturbed by the reluctance of white Southerners to ratify the 13th Amendment, their refusal to grant voting rights to black men, their enactment of black codes which limit the rights and liberties of blacks, and their election of former Confederates, such as Confederate Vice President Alexander Stephens, to state and national offices. February 1866: Congress passes the Freedmen’s Bureau Act, which extends the temporary agency’s life indefinitely and gives the military the responsibility of protecting the civil rights of black Americans in the former Confederate states. President Johnson vetoes the bill, surprising many Republicans. April 1866: Congress enacts the Civil Rights Act of 1866. It grants citizenship to all persons born or naturalized in the United States, and guarantees them equal rights under the law. The statute makes it a federal crime, punishable by fine and imprisonment, to deprive any person of his or her civil rights. Judicial authority over the act is assigned to the federal courts. President Johnson vetoes the bill, but Congress overrides the veto and the bill becomes law. May 1866: A race riot erupts in Memphis. June 1866: Congress approves a proposed 14th Amendment to the U.S. Constitution. Its text begins with the first definition of citizenship in the Constitution: all persons born or naturalized in the United States. It thereby attempts to give the citizenship clause of the Civil Rights Act of 1866 more legitimacy and permanency by incorporating it into the Constitution. The amendment also denies states the authority to deprive citizens of their privileges and immunities, the due process of law, or the equal protection of the law. July 1866: Congress passes the Freedmen’s Bureau Act a second time. President Johnson vetoes it again, but this time Congress overrides his veto. Congress votes to readmit representatives from Tennessee after that state’s ratification of the 14th Amendment. A race riot occurs in New Orleans. August - September 1866: President Johnson, joined by key administration figures, embarks on a speaking tour called the "swing around the circle." The president is trying to build support for the election that fall of politicians sympathetic to his policies. He imprudently, if sarcastically, suggests the execution of leading Radical Republicans and sincerely blames Congress for the New Orleans riot (they blame him). Rumors fly of Johnson’s alleged drunkenness. The tour is a public relations fiasco, undermining popular and Congressional support for the president. Fall 1866: The Congressional elections are seen as a national referendum on the proposed 14th Amendment. Republicans score a major victory, gaining seats to give them over a two-thirds margin in the next Congress—more than enough to override any presidential vetoes. March 1867: Congress passes the first Reconstruction Act. The former Confederacy is divided into five military districts under the direction of military officers, who are supported by federal troops. Military courts can be used to try cases involving civil and property rights violations, as well as criminal trials. States have to enact new constitutions that grant voting rights to black men. High-ranking Confederate officials are temporarily barred from political participation. States must ratify the 14th Amendment in order to be represented in Congress. President Johnson vetoes the bill, but Congress overrides the veto. The Southern states, though, refuse to carry out the law. Congress passes the second Reconstruction Act. It gives the military district commanders directions on holding state constitutional conventions. The president vetoes the bill and Congress overrides his action. The president is forced to implement Congressional reconstruction, but the Johnson administration interprets it as narrowly as possible. July 1867: Congress enacts the third Reconstruction Act. It affirms the authority of the military district commanders to remove state officials from office. Fall 1867: The remaining ten unreconstructed states vote to hold constitutional conventions and thus begin the process of reconstruction under the Congressional military plan. At this time there are 15,000 troops in the South—only 1 soldier per 725 inhabitants. By 1870, the number is down to 6,600, falling further to 3,000 by 1876. March 1868: Congress passes the fourth Reconstruction Act. It allows the proposed state constitutions to be ratified by a simple-majority vote in each state. The House of Representatives impeaches President Andrew Johnson: Johnson had angered Republicans by his interference with and intransigence on various recontruction policies and the Tenure of Office Act. May 1868: The Senate votes to acquit Johnson. He remains in office, but is denied renomination by the Democratic party. June 1868: Congress readmits representatives from seven states: Alabama, Arkansas, Florida, Georgia, Louisiana, North Carolina, and South Carolina. July 1868: The 14th Amendment is ratified by the requisite number of states and becomes a part of the U.S. Constitution. It is one of the most consequential additions to the Constitution in American history. November 1868: Republican Ulysses S. Grant, hero of the Civil War, is elected president over his Democratic rival, Horatio Seymour, the former governor of New York. 1869 - 70: "Redeemer" governments begin to be elected across the South. The majority of white Southern voters replace the biracial Republican state governments, created under Congressional reconstruction, with white-only Democratic state governments, which are sympathetic to the former Confederate cause and opposed to racial equality. In 1869, Tennessee establishes a "redeemer" government, with Georgia, North Carolina, and Virginia following suit in 1870. February 1869: Congress passes the proposed 15th Amendment to the U.S. Constitution. It attempts to shore up the constitutional protection of black voting rights by stipulating that voting rights cannot be denied on the basis of "race, color, or previous condition of servitude." It also gives Congress the enforcement authority through appropriate legislation. April 1869: The U.S. Supreme Court announces its decision in Texas v. White, upholding the constitutionality of Congressional Reconstruction. In a 5-3 decision, Chief Justice Salmon Chase declares that the Union is "composed of indestructible states," thus making secession illegal; that although Texas had never left the Union, it no longer has a legitimate state government; and Congress has the authority to restore a republican government to the state. Early 1870: Congress votes to admit representatives from the remaining three unreconstructed states: Mississippi, Texas, and Virginia. March 1870: The 15th Amendment is adopted by the requisite number of states and becomes part of the U.S. Constitution. May 1870: Congress enacts the first Enforcement Act to enforce the 14th and 15th Amendments. The law makes the bribing, intimidation, or racial discrimination of voters into federal crimes. The statute also strengthens federal authority against anti-black groups like the Ku Klux Klan by outlawing conspiracies aimed at preventing the exercise of constitutional rights. February 1871: Congress passes the second Enforcement Act authorizing federal supervision of Congressional elections in cities with populations exceeding 20,000. The South was largely unaffected by this law, however, since there were few cities of that size in the region. April 1871: In response to President Grant’s request for more federal authority to combat anti-black violence in the South, Congress enacts the Ku Klux Klan Act. It grants the federal government the authority to punish the denial of equal protection or privileges and immunities. In addition, the statute bestows on the president the power to suspend habeas corpus and to use the military against anti-civil rights conspiracies. October 1871: President Grant, acting under the authority of the Ku Klux Klan Act, imposes martial law and suspends the writ of habeas corpus in South Carolina. November 1872: President Grant wins reelection against his Democratic/Liberal Republican opponent, New York Tribune editor Horace Greeley. 1873: A redeemer government is elected in Texas. Fall 1874: Democrats win control of both houses of Congress for the first time since before the Civil War. Redeemer governments win control in Arkansas and Alabama. March 1875: The outgoing Republican Congress enacts the Civil Rights Act of 1875, long advocated by Senator Charles Sumner, who died shortly before its passage. It outlaws racial segregation in all public accommodations regulated by law, such as hotels, theaters, steamships, and railroads. The U.S. Supreme Court will rule the law unconstitutional in 1883. 1875: A redeemer government is elected in Mississippi. Nov. 1876 - Feb. 1877: Samuel Tilden, the Democratic presidential nominee, wins a narrow majority of the popular vote against Rutherford Hayes, the Republican nominee. The electoral votes in three states—South Carolina, Florida, and Louisiana—are disputed. They are the only Southern states left with federal troops stationed there under Reconstruction policy. A bipartisan electoral commission is appointed by Congress to settle the controversy. On a party-line vote, it gives all the disputed electoral votes to Hayes, making him president. After his inauguration, President Hayes removes the final federal troops from the three states. 1877: After his inauguration, President Hayes removes the remaining federal troops in South Carolina, Florida, and Louisiana from political duty (guarding the statehouses). Redeemer governments assume power in South Carolina, Florida, and Louisiana. Following a bitterly disputed presidential contest between Republican Rutherford B. Hayes and Democrat Samuel Tilden, in which both candidates claim victory, Hayes is declared president. In a back-room political deal, the Republicans agree to abandon Reconstruction policies in exchange for the presidency. Reconstruction policies officially end. 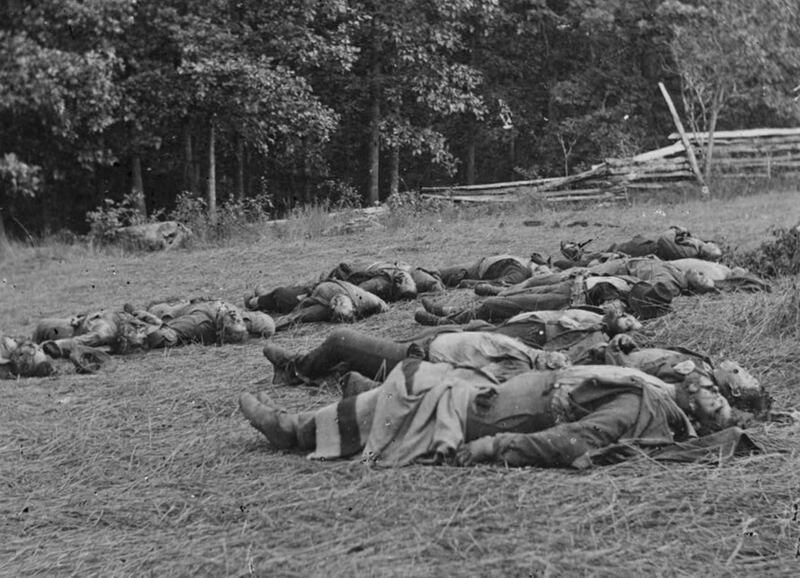 And, although the South had been defeated in Civil War, it claimed that it had won the "War for Reconstruction."